Perhaps no environment is more iconic, more varied, and more fearsome than the dungeon, and when you delve into the perilous, monster-infested ruins of ages lost, you need all the help you can get! Intrepid explorers in search of the ultimate tomb raider's boon need for any adventurer looking to brave the world's most infamous dungeons. Informative and inspiring articles on iconic dungeon elements and tips on how to survive the deadly traps, monstrous inhabitants, and cursed treasures you'll undoubtedly encounter. New archetypes perfect for characters that frequently find themselves deep underground or in forgotten catacombs, including the trap breaker alchemist, terra-cotta monk, and dungeon rover ranger. New spells and magic items for every dungeon situation. 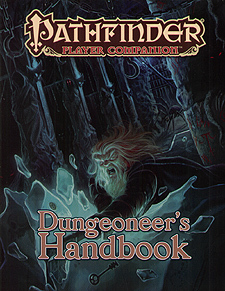 Rules for dungeon guides - informative (but oft-misleading) tomes that can be either a boon or a curse for those aimlessly wandering dungeon halls. Archetypes and rules for hirelings who can take care of your estate and other mundane matters while you're away on your latest excursion. New dungeon-related feats, traits, dungeoneering aides, alchemical equipment, and more!